Scientists from the U.S. Geological Survey (USGS) say 71 percent of Earth’s surface is water-covered. After recent events at my company, though, I would argue with the USGS that 71 percent of Earth’s surface is not covered in water. 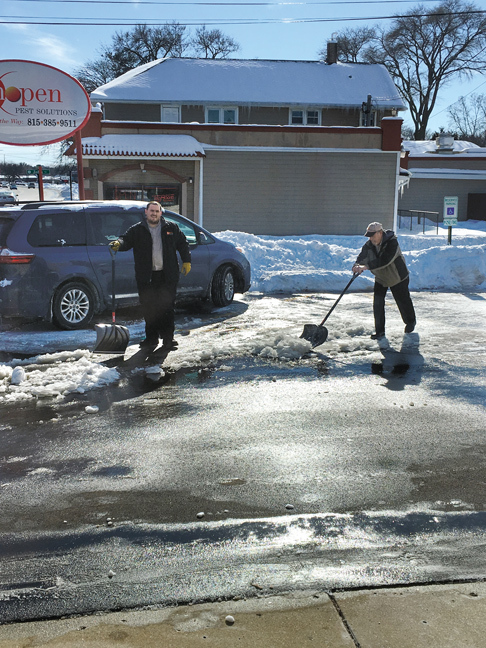 You see, that would be impossible: At least 50 percent of Earth’s water can be found in Schopen Pest Solutions’ parking lot. We had a rough winter when it came to H2O. We had water coming out of our floor drains and through our ceiling tiles. We had rivers running in our garage, and we had a glacier in our employee parking lot. Everywhere I turned, there was frozen water, sewage-tainted water, rusty water, dirty water, smoke on the water (oh, never mind, that is a Deep Purple song). Naughty water! Mistake No. 1: When I purchased our building a year ago, we had nearly $300,000 worth of work done for the rehab project. We put in new floors, bathrooms, walls, electrical, conference room, chem room, phone lines, gas lines, etc. What we failed to look at was the plumbing under the building. The sewer system that leads out to the main line under the street is more than 70 ft. long. In fact, it goes directly under my office. It is comprised of cast iron that is more than 50 years old. As it ages, it becomes pitted, and sharp edges appear. These sharp edges act like hooks and snag toilet paper. The toilet paper clogs the lines the same way fast food clogs your arteries. Over time, the system backs up and you get sewage in the floor drains. To make matters worse, our building was a grocery store with a deli. The old deli is exactly where our new bathrooms are located, in the center of the building. The sewer lines are coated with years of gristle and fat. So when the floor drains back up, the first things to appear are giant globs of grease. Mistake No. 2: In the garage area, we originally had a floor “pit” that was covered with a grate and collected water. When we redid the garage floors with epoxy, we had the pit filled in. All of the ice and snow on the work trucks melts and creates a lake in the garage. That runoff travels right over the smooth floor — and into my manager’s office. Mistake No. 3: We knew we had a sketchy roof on our building, but it passed the city codes and my contractor felt that, with a little TLC, we would get another three to five years out of it. Thus, I paid $12,000 for slight repairs vs. the $35,000 or so that eventually would be needed for a new roof. The roofer has been out to our building seven times (for free), but we still have multiple leaks. 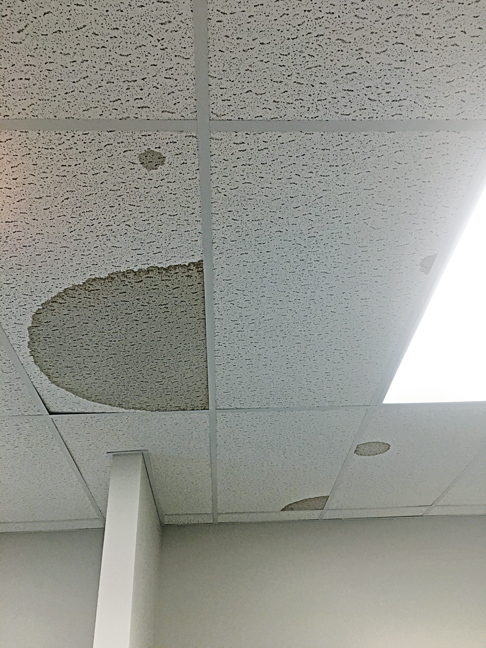 There are several places in our building where we stopped adding ceiling tiles because they get ruined every time it rains or snows. Mistake No. 4: Because we have a flat roof, we have a downspout that runs from the center of the roof, through the building and then exits on the south side of our structure, about 6 ft. off of the ground. To save money, we just had the water empty onto the parking lot through a polyvinyl chloride (PVC) pipe. I should have had the contractor run a secondary drain line underground from the PVC piping to the street. When we moved in during the fall, it wasn’t a big deal. But this winter, we had a frozen river running from the building to the parking spaces. It was incredibly dangerous for all of my employees. When you have ice 4 inches thick, you can’t easily salt it or remove it. Check back next week to read more: The author share’s what he did to remedy most of these water issues.